OMG so much snow here in Virginia. This is a taste of Canada for the weekend. I’ve been digging for two days and got most everything cleared out. If any of you were hit with this blizzard/nor’easter, I hope you’re safe and warm. 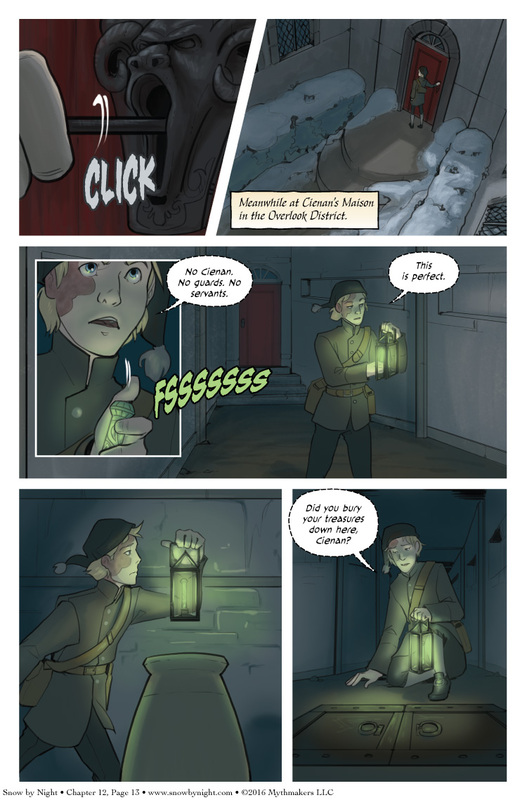 And hey, a new page for you! Jassart sneaks into Cienan’s maison on Chapter 12 Page 13. To see what he finds below, please vote for Snow by Night on Top Web Comics (evil cackling). No guards? Not even any servants? Yep, it’s a trap. At this point, I almost suspect it *isn’t* a trap, just because that would be a huge plot twist. That –would– be pretty twisted! Jassart’s expression looks like he might be missing his companion in crime. It fits very well with Cienan his carefulness and jassart his cockiness for this to be trap. I am very curious though what kind of trap. What is the game Cienan is playing? Of course, perhaps the true trap is letting Jassart take the psychotic soul-eating mask back to the governor’s manse.